While container candles can be made with a variety of waxes, here we are going to primarily address common issues that arise with the use of paraffin wax as natural waxes sometimes have their own troubleshooting issues to address. One issue is the presence of lines on the inside of the glass. Most often, this problem occurs for one of two reasons. The container was not preheated before either the wax was poured into it, or the wax was too cool when it was poured. To avoid this issue, try preheating your containers using a heat gun, or your oven on the lowest setting, before pouring into them. Also, try to pour your candles when the wax temperature is between 155 to 175 degrees Fahrenheit or 68 to 79 degrees Celsius. Another common container candle issue is when the flame burns a tunnel down the middle of the candle. Typically, this is caused by one of two reasons. Most often, either the wick used in the candle is too small, or the candle was not burned for a long enough period. If you are experiencing tunneling, try using a larger wick size or consider double wicking. If this alone does not appear to be the problem, pay attention to the length of time you are burning the candle. The ideal burn time is long enough for the melt pool to form completely across the top of the candle before extinguishing. When wicked properly, this should happen in one to two hours. Another common issue is the formation of discolored splotches on the sides of the candle. Usually, these splotches are the result of either having too much fragrance oil in the wax mixture or from having too much of the wrong type of additive in the wax. If you believe that fragrance may be the problem, try reducing the amount of fragrance or adding vybar to the mixture to help the wax retain the oil. If you think that additives are the issue, just remember to always use the least amount necessary to achieve your desired result. If you experience problems with the wick smoking too much when the candle is burning, you may have one of the following issues. The candle is in an area with too much draft. Try using a smaller wick that is trimmed to about one quarter of an inch. In addition, make sure that there are no drafts where you are burning the candle, bearing in mind that some waxes do tend to smoke more than others do. If your wick will not stay lit, it may be too small or you may have used too much dye and/or fragrance oil. If the wick is too small, it cannot consume wax fast enough to keep it above the wax level. Try using a larger wick to correct this. If you believe you used too much dye or fragrance oil, reduce the quantity and try again. When container candles cool, sometimes the tops appear bumpy or rough. If this happens to you, consider placing the candle in the oven on the lowest setting to re-heat the wax. Let it cool again and see if the problem persists. 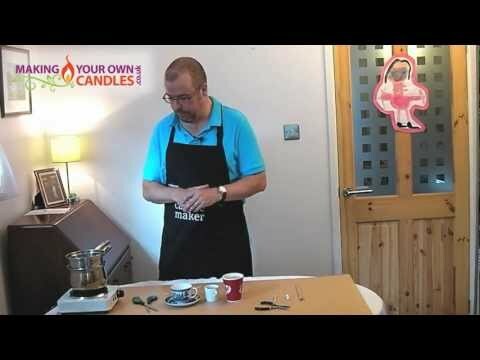 Another technique is to use a heat gun along the top layer of the candle to re-heat it. Again, let it re-cool and see if this corrects the issue. If you are still experiencing the problem, consider doing a top pour on the candle. A top pour uses leftover wax from the candle by re-heating it and pouring it over the already cooled candle creating a new, smooth top layer. If you use this technique, be sure to use leftover wax otherwise, you will have a top layer of a different color. If you find that the top layer of the candle keeps cracking as it cools, then it is likely that your candles are drying too quickly. Try placing them in a warmer place to cool more slowly, or consider wrapping the containers in aluminum foil so they are insulated and slower to cool. Numerous issues may arise when pouring container candles. If you have other problems not covered here, try searching online candle making message boards and forums to find solutions. Just keep in mind that other candle makers have probably experienced them too, and there is usually a way to correct the issue if you seek help.